Hall of Gods Slot - ▶️ Max Payout of 4,000 coins! Will the gods be in your favour to make you rich beyond your wildest dreams or will they turn their backs on you? See what their verdict will be on the reels of Hall of Gods by Net Entertainment. This popular progressive jackpot slot is one of the most played jackpot slot games, along with Mega Fortune. One lucky spin on this game can turn you into a millionaire if the gods decide to grant you the Mega Jackpot. Hall of Gods is a 5-reel, 3-row, 20 payline slot. The slot is inspired by Nordic mythology, with all of the Norse Gods as the main game symbols. 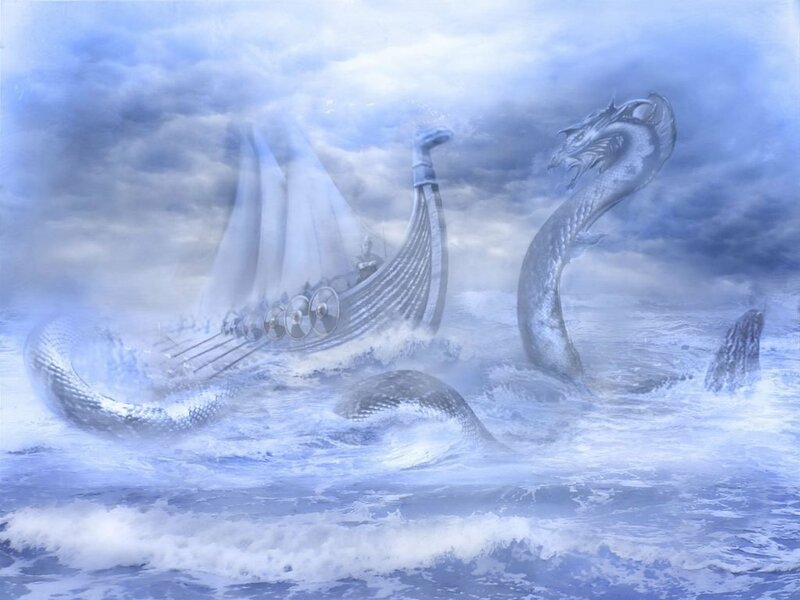 The reels of the game are set high in the sky with a Viking ship fighting a dragon in the background. The game has an attractive visual appearance with a vibrant choice of colours and subtle animations. The designers put in a lot of work into the game, which is expected for a jackpot slot like this one. The number of paylines in the game is fixed so in order to spin the reels you will only need to set the Bet Level and the Coin Value in order to start playing. The base play in the slot offers some excitement, although it’s not on the same level as in the bonus rounds. The biggest excitement comes from a Wild symbol landing on reels 2,3 or 4, that expands to cover the entire reel it lands on, making way for bigger payouts to happen. 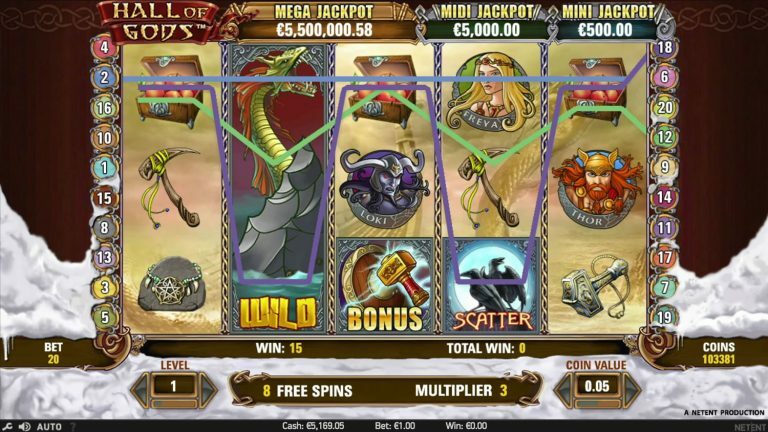 The biggest payouts in the slot come from the 5 Norse Gods symbols. The highest payout of 4,000 coins comes from Odin, followed by smaller payouts from Thor, Freya, Loki and Idun. The lower tier symbols in the slot are the Ring, Hammer, Necklace, Axe and Treasure Box. The special symbols in the game are represented by the Wild Dragon, Scatter Raven and Bonus hammer symbols. The bonus game in Hall of Gods is triggered when 3 bonus symbols land on reels 3, 4 and 5. This is a cash bonus game where you need to smash shields to reveal coin prizes. You keep smashing the shields until three matching values are revealed. The maximum coin prize in this bonus game is set at 7,500 coins. The free spins bonus in the game is triggered when 3, 4 or 5 Scatters land anywhere on the reels. In return, you will be rewarded with 10, 15 or 20 free spins respectively. Additional free spins can be won during the free spins round by landing another set of 3 or more scatters. All payouts during the free spins bonus are tripled in size. Note that if you trigger the bonus game during free spins, the x3 multiplier does not get applied to bonus game winnings. Hall of Gods is a progressive jackpot slot with 3 attached jackpots. Players have a chance to win the Mini, Midi or Mega jackpot on any bet size. The jackpots can be won during the Bonus game. When the player smashes the shields, some of them may reveal the Mini, Midi or Mega Jackpot. Winning a progressive jackpot requires activating the bonus game and revealing 3 matching jackpot symbols. The Mini jackpot in the game has a starting value of €100, the Midi starts at €5,000, while the Mega jackpot starts at €100,000. The Mega Jackpot can run into the millions. At the time of this review, the Mega Jackpot was standing at over €3.2 million. Hall of Gods has a fixed number of 20 active paylines. The RTP value for Hall of Gods is 95.5%. This is a little bit lower than most other video slots but is to be expected since this is a progressive video slot. Hall of Gods is considered as a low to medium volatility slot. Net Entertainment is without a doubt one of the leaders in the industry when it comes to video slots. Hall of Gods is one of their most popular jackpot slots and one of the most popular online jackpot slots in the world. Even though the game is constantly in the shadow of Mega Fortune, it is still the number one choice for many players chasing the big win. Hall of Gods slot is great fun to play; even if you don’t get to win a progressive jackpot, there is still plenty of cash to be won. Of course, the most attractive part of the slot is the Bonus game where you could walk away as a millionaire. It’s time to see if the Gods are going to grant you riches beyond your dreams. Take Hall of Gods for a spin right now at LeoVegas!